Jordan Gray was 14 years old when his mother, Vivianne Pommier, received her first kidney transplant. He was too young to donate one of his kidneys to her, but throughout high school and college, he promised he would if the time came. “I wanted to be able to help my mom,” he said. More than a decade later, Pommier’s donated kidney began to fail, and Gray was prepared to fulfill his promise. But he wasn’t a match. Like Gray and Pommier, Aziza Al Ahmari wanted to donate to her husband, Abdullah, and James DiNatale wanted to give to his wife, Carol Miller, but the couples — compatible in life, incompatible in kidneys — weren’t perfect matches. All three potential recipients had received kidney donations before, and as a result, all three had become “sensitized;” they had developed antibodies that made finding appropriate donors more difficult. Enter Keith Melancon, M.D., chief of the Division of Transplant Surgery, director of the Transplant Institute at GW Hospital, and professor of surgery at the GW School of Medicine and Health Sciences (SMHS). The “rock star” surgeon, as he’s known, regularly performs the trickiest, most complicated kidney transplants. In June 2015, Melancon, along with Thomas Jarrett, M.D., chair and professor of urology at SMHS, performed the first-ever three-way paired kidney exchange at GW Hospital by mixing and matching the mother-and-son and husband-and-wife couples. DiNatale donated to Abdullah, Gray to Miller, and Aziza to Pommier. 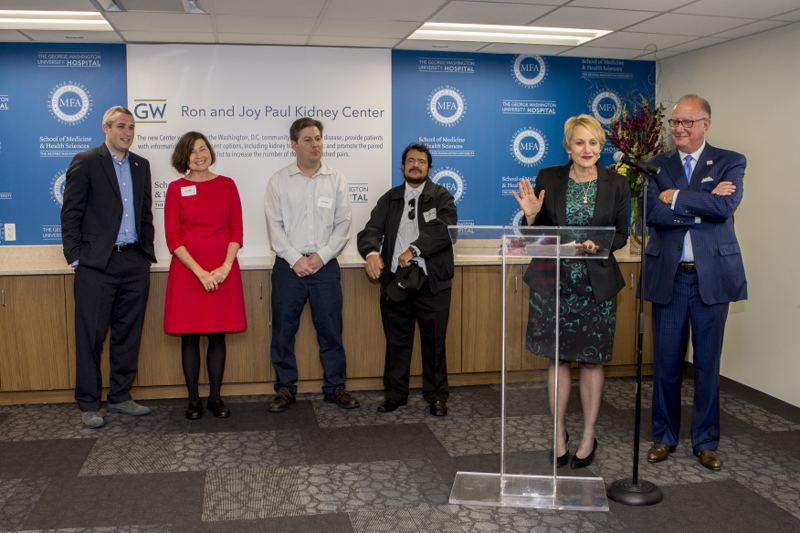 The donors had never met the recipients — until the launch of the GW Ron and Joy Paul Kidney Center on Nov. 5. As they stood at the front of the Weingold Conference room in Ross Hall, four of the six (Aziza and Pommier were unable to attend the event) greeted each other. Hugs replaced handshakes, and Miller and Abdullah teared up. “We’re going to do plenty more,” Melancon promised, while the four pulled on GW hoodies and continued to talk with one another. That ability to do more comes with the new center, designed to educate the Washington, D.C. community about kidney disease, provide patients with information about treatment options, and promote the paired kidney exchange list, the one from which Pommier, Abdullah, and Miller benefitted. Washington, D.C. has some of the highest rates of kidney disease and failure in the nation. There are around 700,000 people with kidney disease in the District; 7,000 are on dialysis; and 1,700 are waiting for a transplant. The demand for kidneys, however, especially from live donors, far outweighs the supply. Melancon, along with Barry Wolfman, M.S. ’84, CEO of GW Hospital, and Jeffrey S. Akman, M.D. ’81, RESD ’85, vice president for health affairs at GW, Walter A. Bloedorn Professor of Administrative Medicine, and dean of SMHS, are hoping that outreach from the new center will help right that scale. “Out of every crisis, opportunity presents itself, and this one is no different,” Wolfman said to the crowd of health care professionals and advocates. On Jan. 19, 1990, he received a donation from his brother, Steven. Almost 20 years to the day after his first transplant, Paul received a second kidney, this time from longtime business associate Kathy McCallum, on Jan. 21, 2009. Since the announcement of the center, Joy Paul said that she has received more than 100 calls from people looking for more information, and she and her husband have been rocked by both the stories they have heard and the need for help. “I firmly believe that with the talent we have around this room and around the city, we can make a difference,” Mr. Paul said. GW Today: "GW's Kidney Center Provides Health Solutions in Washington"
The GW School of Medicine and Health Sciences, GW Hospital, and the GW Medical Faculty Associates will host an event on Thurs, Nov. 5, to announce the Ron & Joy Paul Kidney Center. The GW School of Medicine and Health Sciences, in concert with GW Hospital and the GW Medical Faculty Associates, has established the Ron & Joy Paul Kidney Center to raise awareness about kidney disease and increase live kidney donation in Washington, D.C.